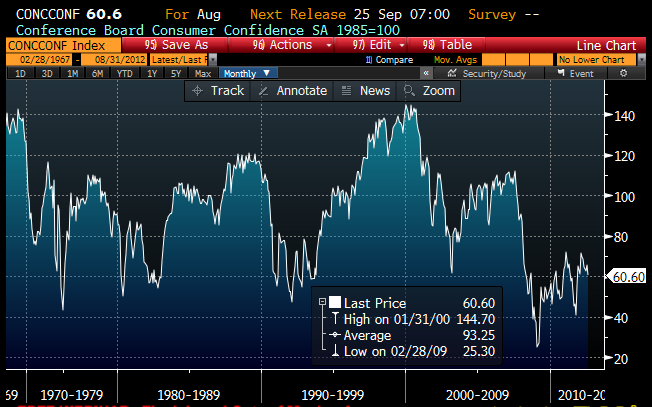 The Conference Board's measure of consumer confidence in August was weaker than expected (60.6 vs. 66). As the charts above and below show, although confidence is up from the all-time lows of the last recession, it is very close to the lows associated with every other recession in the past 45 years. This is a reminder that pessimism still rules. The best way to interpret the rally in equities in the past 3+ years is to see it not as a return of optimism, but rather as a grudging acknowledgement that things haven't turned out as bad as expected. 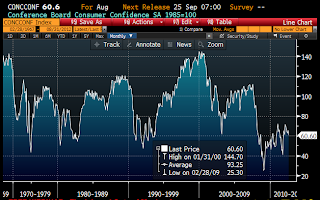 Last time CONCCONF fell to 60 was in May 2008. SPX then 1,375-1,440. Enough said.